Olympus Zeus medium fresh salsa. Loaded full of flavor with a slight bite Zeus will leave your taste buds watering for more. Tomatoes, apple cider vinegar, green peppers, onions, garlic, jalapenos, habaneros, lime juice, cilantro, sea salt, stevia in the raw (maltodextrin), black pepper, and citric acid. Olympus Aphrodite mild fresh salsa has a sweet and savory flavor. Not sugar sweet since there is not sugar added. A delicious crisp sweet from the apple cider vinegar. 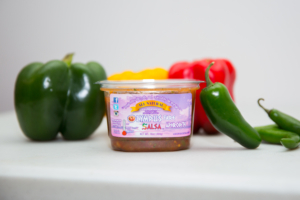 Our Aphrodite is the perfect salsa for cooking. Make any food taste that much better without adding heat. Tomatoes, apple cider vinegar, green peppers, onions, garlic, jalapenos, lime juice, cilantro, sea salt, stevia in the raw (maltodextrin), black pepper, and citric acid. 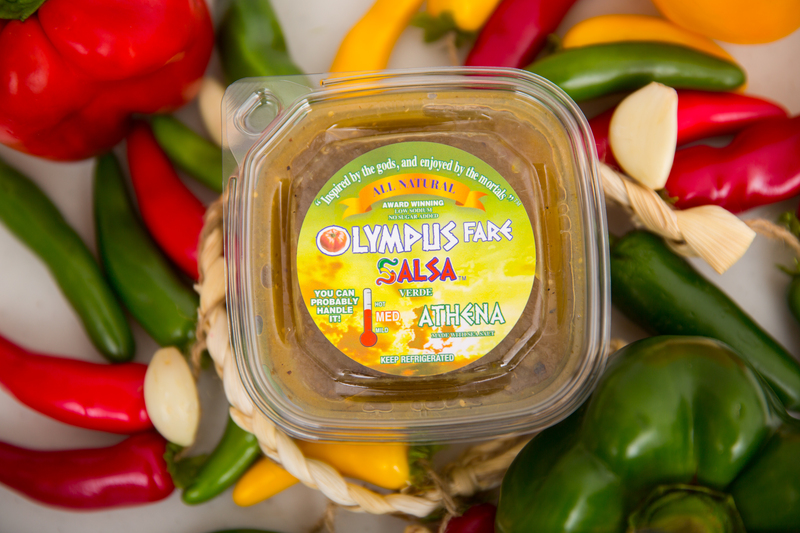 Olympus Athena Fire Roasted Tomatillo medium fresh salsa has a savory citrus bite. 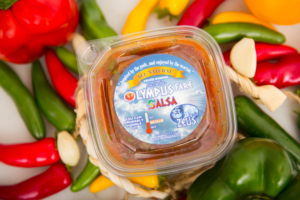 Finished off in a white balsamic vinegar this salsa pairs with almost anything. From poultry, pork, shrimp, we haven’t found anything we don’t like it on! Roasted tomatillos, water, onions, roasted garlic, white balsamic vinegar, Serrano, jalapenos, sea salt, lime juice, habanero, stevia in the raw (maltodextrin), and citric acid. 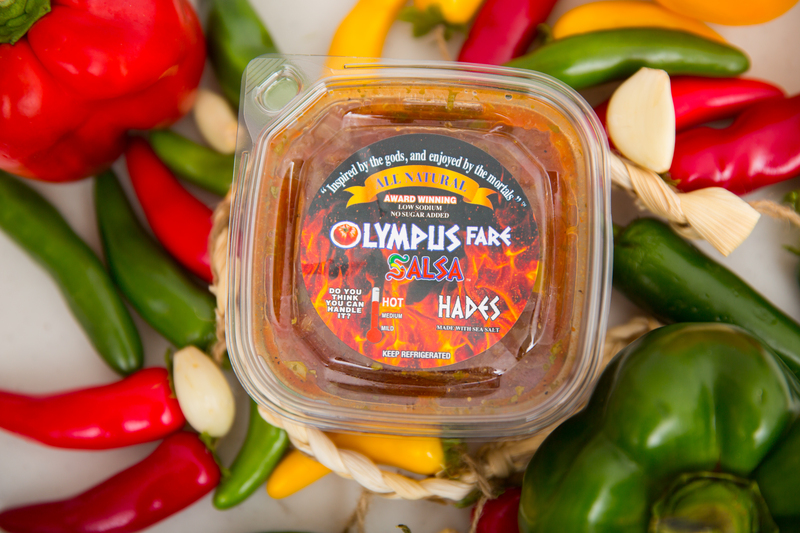 Olympus Hades hot fresh salsa. Dan and Stacy’s favorite although they’d tell you to combine Hades and Athena to your chip for the most amazing flavor combination. Not to hot. It’s nice with layers of flavor. Gets you in the back of the throat not the tip of the tongue. Hades keeps you coming back for more and more and more….. Tomatoes, apple cider vinegar, green peppers, onions, garlic, jalapenos, Serranoo peppers, lime juice, habanero sea salt, stevia in the raw (Maltodextrin), black pepper, and citric acid.